Transpiration can be measured by an instrument called a potometer. 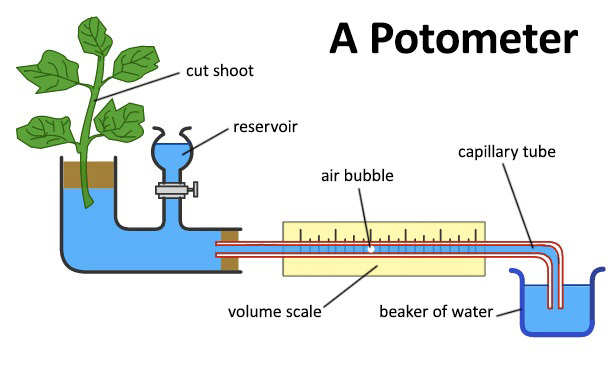 The diagram below shows the apparatus set up for a potometer. Vaseline is applied around the rubber bungs to ensure an airtight seal, thus the only water loss from the apparatus is via transpiration. The function of the reservoir is to allow the air bubble to travel back to the start of the measuring scale on repeating the experiment. As water moves up through the plant the air bubble moves along the scale giving a measure of water absorbed by the plant over time and hence the transpiration rate. The animation below shows how the rate of transpiration is measured using a potometer.